Last December, Room One Corp., which owns the Cocoaplex Cinemas in Hershey, placed the winning bid in an auction for MoviE-town. For $1.325 million, Room One bought a seven screen theater that was sorely in need of maintenance and upgrades. This included interior and exterior painting, paving the parking lot, repairs to light poles and upgrading the projection of movies to all digital. It was a year before that one of my Twitter followers tipped me off that MoviE-town was for sale for $2.2 million. 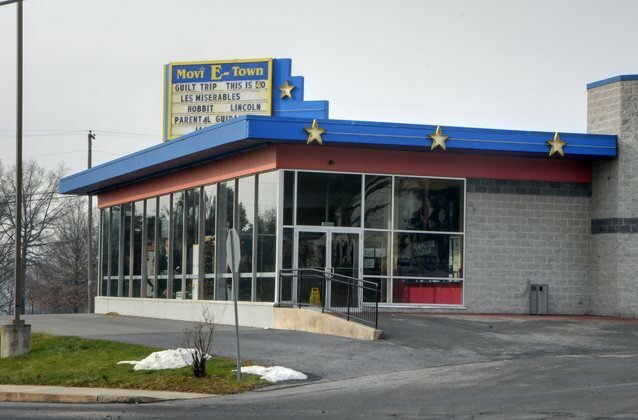 In coverage of the auction, LancasterOnline reported that Room One bought MoviE-town from Metro Bank, which had foreclosed on the theater in 2013. Just last week, I saw an announcement on the marquee that all of the screens have been upgraded to digital projection. So I contacted Heather Sweeney, the operations manager for The Town's Theaters, which is the management subsidiary for Room One. She agreed that the digital upgrades, and other investments, ensure movies will be shown at MoviE-town for a long time. There will be a grand reopening for VIPs by invitation only on May 10. Sweeney graciously answered some questions about the upgrades. Chronicling Elizabethtown: What are your plans for showing movies in Elizabethtown? Heather Sweeney: We plan to continue to show the most recent films available to the market. With an additional 7 screens added to our family, hopefully we will be able to see more film that is sometimes released on a limited basis or only to megaplexes of 14 or more screens. All screens are now in a crisp, defining digital HD presentation. Why make the commitment to theaters that in some cases compete with Cocoaplex? The Town’s Theatres is committed to the family based community. Elizabethtown is a small family based town that doesn’t currently offer too much recreationally and we are dedicated to keep their current movie theater alive and ready to serve the public. I know there's a move in the industry to switch to digital projection at theaters. What are the benefits? Any downsides (except for the investment to switch)? Some benefits include less maintenance, lower electric costs, lower payroll costs, lower shipping costs and a clear, crisp picture every show. 35mm film would often have issues that may have decreased the presentation quality for the rest of the film's run. Downsides, in my opinion, would be that managers like myself that projected 35mm film for 18 years miss the interaction with the booth equipment. The cost is extremely high to convert to digital as well. When you require parts for digital they often need to be made to order and are more expensive than 35mm parts. Projector bulbs need to be changed more frequently and cost $800 each. What differences will movie audiences notice with digital projection? Clear, crisp, defined presentation every time. Digital sound that utilizes every speaker in the auditorium, every show. Have all of Movi-E-town's theaters been upgraded to digital projection? Yes. Even the pre-show intermission ads are a digital presentation. Renovation items include: parking lot paved and lined, interior and exterior paint, roof repairs, seat and carpet cleaning, concession stand upgrades, additional games in the arcade, a new digital marquee. I am almost as excited about the parking lot as I am about the improvements inside. The way things look on the outside sends a message about the operation as a whole, and I'm pleased to see the investments. I am also happy to see this investment but hope that the new owners will be community minded and not just take revenue from us. Glad to see good Business people take over. I wonder if the drainage issue has been fixed and the water. I looked into purchasing the mini-golf course only to find out that the property did not meet storm water drainage requirements. That the golf course water was run off the movie theater with a private meter. Mt. Joy Township was of the opinion the golf course didn't have water. Not sure how they opened. And almost half of the course was built across a property line. Requiring either a rent agreement for the land and parking or purchasing the adjoining property at an inflated price. Needless to say I walked. I have seen the golf course look's like it may be for sale again. Maybe Room One will see it as a good addition to the property they already have and can make a go of it. I can't speak to the water/drainage issues or the mini golf. If the situation is accurate as described, those would be some significant hurdles to overcome in my mind.